I love leopard and I have numerous items of clothing featuring leopard prints but these are my first pair of leopard pants! I think these pants will be my one and only pair of leopard pants, however, because why mess with perfection? First of all, I like how the leopard print on this particular pair of pants is small and understated so that they don't exactly scream "leopard" and function more as a neutral. Also, they are made of silk which makes them feel so soft and luxurious; they are almost like some seriously chic silk pajama pants! Last of all, J. Crew is having a sale right now off of everything, even regular prices, so it makes these pants a pretty good deal! These photos were taken at the Irvine Spectrum center in Orange County. 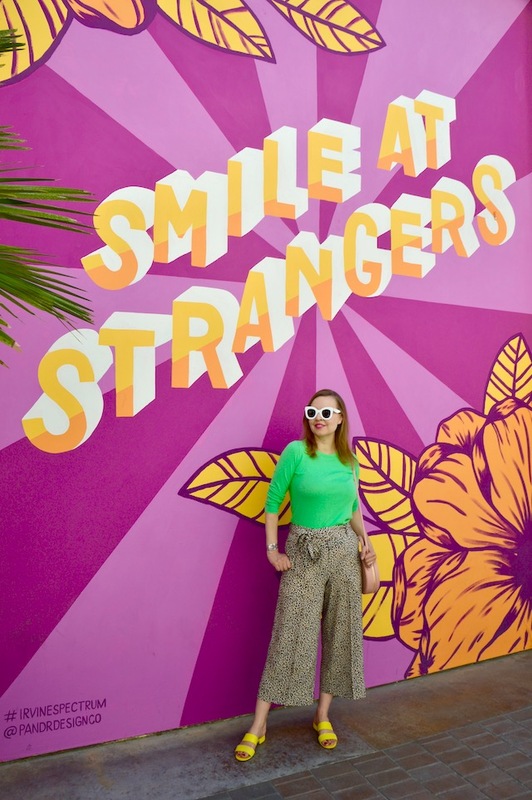 Orange County seems to be exploding with some cool murals and colorful locations, which is very exciting! 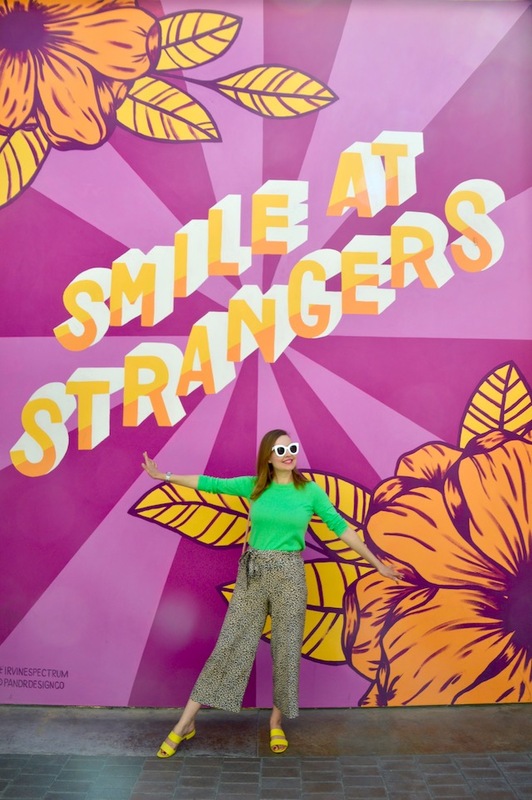 I found this "Smile at Strangers" mural a few months ago when I visited the mall for the first time. I made a mental note that I wanted to do a photo shoot with the mural as a backdrop but I had trouble locating it the second time around. One of the reasons that it was so difficult to find is that it's kind of tucked away in an out of the way location that's near the restrooms. Also, to be perfectly honest, I have a terrible sense of direction! My husband and I were wandering around the mall with me saying "I think it's just down here" seemingly 50 times before finally finding it! Oh my gosh all of these COLORS - I am in LOVE! Thanks so much for sharing! One wouldn't suppose that such very different colors would come together so well, but they truly do! you are always a burst of color and sunshine and make me smile! So glad you found it! lol, our poor Blog/Instagram husbands! Jeremy made me start placing pins on Google maps when I found a photo location and save it so I could find it later! Maybe you should try! Gorgeous!! 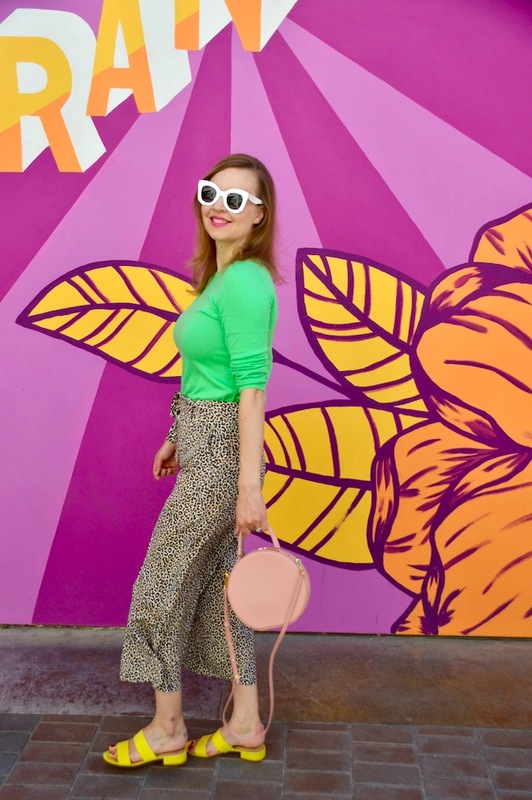 I am loving these types of pants this season. It's so nice to wear something besides skinny jeans, and I feel like they are flattering and stylish in a whole new way. I always love your colorful and cheerful vibe. 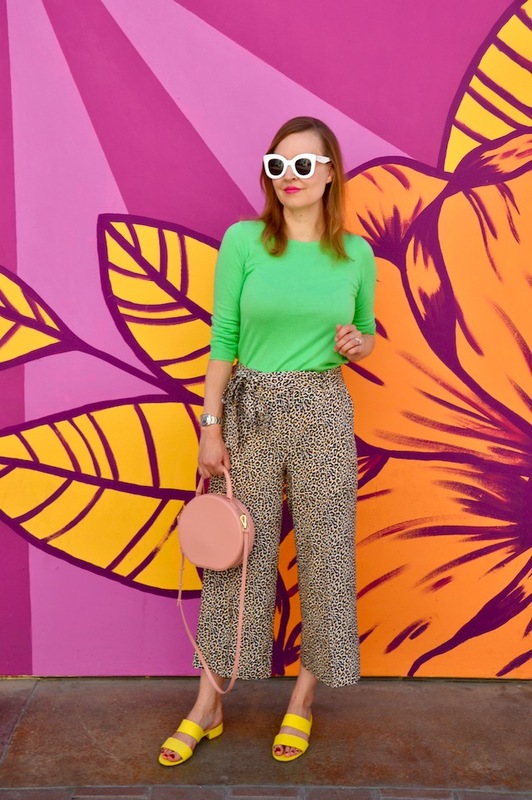 I love the pairing of leopard print and bright green! The yellow sandals are fabulous too! Such a cool mural. Thanks for linking up!